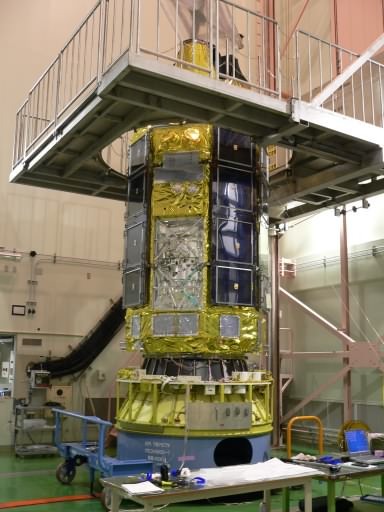 One June 19, Astro-E2 was connected with the 3rd stage of M-V-6 (Mu five rocket No.6). 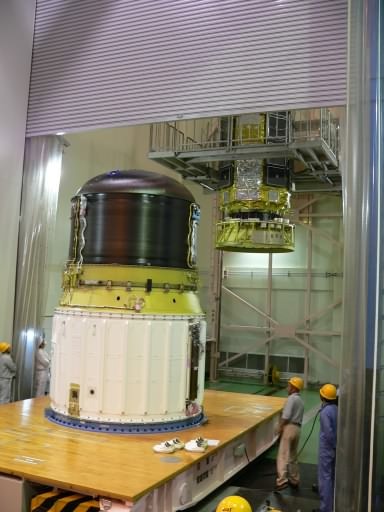 First, Astro-E2 was connected with a payload module of the 3rd stage (yellow part under the spacecraft in Photo 1). After that, there were many activities such as adjustment of satellite separation mechanism, electrical connections between the rocket and the satellite. At around 7:30pm, the satellite with the 3rd-stage payload module was hoisted with a crane(Photo 2 back), and the 3rd-stage rocket was carried in (Photo 2 front). In the photo, you can see the 3rd stage in the near side. The upper black part is the 3rd-stage motor, the lower white part is a payload module of the 2nd stage. 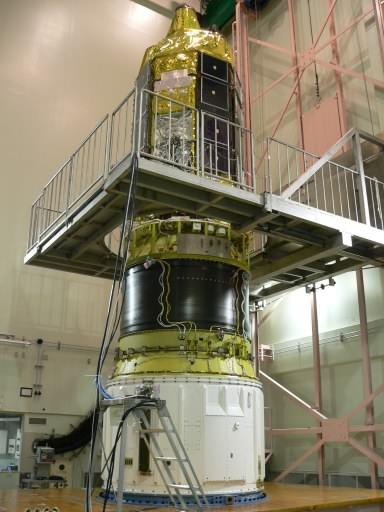 The nozzle of the 3rd-stage rocket is hidden in the 2nd-stage payload module. Then, the satellite and the 3rd-stage rocket was mechanically connected as shown in Photo 3.